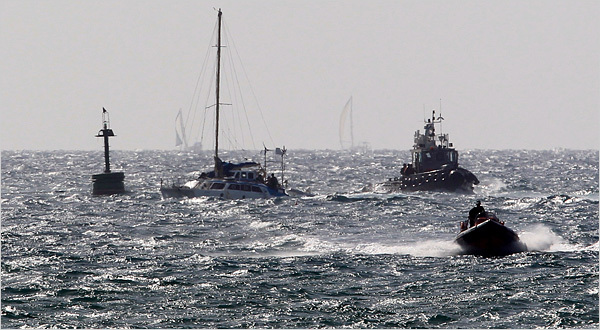 As yet another boat—a Jewish one this time—is forcefully boarded by the Israeli navy while attempting to run the blockade of Gaza, a natural question for many Americans is: Why are boats still trying to run the blockade when Abbas and Netanyahu are in the middle of a peace process? Let’s leave aside for the moment that the blockade, which imprisons 1.5 million people, destroys their economy, and denies them desperately-needed medical and educational resources, is an illegal form of collective punishment. Let’s talk instead about the peace process. It’s fore-ordained to fail by virtually all knowledgeable experts. Why? To begin with, Israel’s insistence on continuing to expand illegal settlements on Palestinian land while talks are ongoing is a stunning display of bad faith. It’s akin to saying, “Let’s negotiate for this pizza. Meanwhile, I’ll be eating it.” The ten-month ‘moratorium’ on settlement construction was a loophole-filled farce, and now even that has ended. A similar show of bad faith helped torpedo the ‘Oslo peace process years’ of the 1990s, during which the settler population doubled to 400,000. Reza Aslan and others have noted that “the peace process, far from being the proper venue to deal with the settlements issue, has provided cover for Israel’s continuing settlement expansion.” Fury at this constant encroachment of their land, as well as the settlers’ unchecked violence, boiled over into the first suicide bombing in 1994 and the second Intifada in 2000. Second, the 1.5 million Palestinians in Gaza are not represented in these talks because their government (which came to majority power through democratic elections, then total power through a violent response to an attempted coup sponsored by the US government) is not recognized and their people are kept in a state of siege. Thus Abbas has no clear mandate to speak on behalf of the Palestinian people. Even if these issues could be resolved, the fact remains that the US is not an honest broker. It bases its red lines on what the US Congress and the governing coalition of Israel can handle politically, not on what is fair or legal according to international law. When the Israeli army was accused of executing an American citizen at point blank range and willfully killing unarmed Turkish activists, the US government said nothing. If they can’t stand up against Israel for American and Turkish rights, how can we expect them to stand up for Palestinian rights? But all of this masks a more important point. In a process where one side displays flagrant bad faith, the ‘mediator’ favors that side, and the other side isn’t fully represented—what will happen if these talks actually “succeed”? This would all take place under the guise of a “peace” that doesn’t exist while the world focuses elsewhere and leaves the Palestinians at Israel’s mercy. One can only imagine the level of expansion and abuse that will be inflicted on the Palestinians once the world is fooled into thinking the conflict is over. Opposition to the current “peace process” is widespread among Palestinians, not because they oppose peace but because most of them, from the secular left to the religious right, understand these dynamics. But any protests are brutally suppressed by Palestinian Authority (PA) police, which are equipped and trained by Lt. General Keith Dayton in a program sponsored by the US government. The Dheisheh Refugee Camp near Bethlehem was recently subjected to a raid by PA forces who came into the camp shooting, trying to intimidate the residents into silence. People started throwing stones at them, thinking they were Israeli soldiers. Whatever Dayton’s forces are working toward, it’s not Palestinian rights, security, or freedom. This is why we continue to send boats to run the siege of Gaza. This is why we push for Boycotts, Divestment, and Sanctions against Israel until it obeys international law. Because Israel and America have all the power in the world to gang up against the Palestinians—even to turn their own security services against them. And the Palestinians have virtually no one—except people of conscience all over the world—to speak for them. Pamela Olson was a journalist and blogger based in Ramallah for two and a half years and a Defense analyst in Washington, DC in 2006-7. She is now writing a book about her experiences called Fast Times in Palestine. 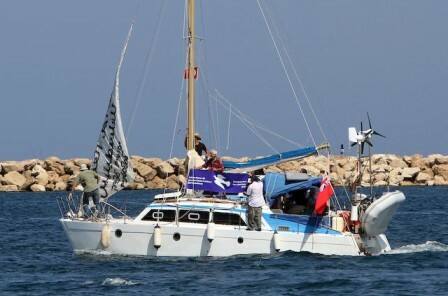 A boat organized by Jewish groups worldwide, and carrying aid for Gaza’s population, has set sail from Cyprus today at 1:32pm local time to run the siege of Gaza. The boat, Irene, is sailing under a British flag and is carrying ten passengers and crew, including Jews from the US, the UK, Germany, and Israel, as well as two British journalists. At a crisis point in peace talks, when Abbas is brutally suppressing dissent against a sham of a peace process and settlers continue to build with near-impunity whether the “moratorium” is lifted or not, Jews and Israelis are calling on Israel to lift the siege on Gaza and end the occupation rather than speak fatuously about endless interim steps while the occupation only intensifies. The boat’s cargo includes symbolic aid in the form of children’s toys, musical instruments, textbooks, fishing nets for Gaza’s fishermen, and prosthetic limbs for Gaza’s hospitals. The Gaza Community Mental Health Programme, directed by Gaza psychiatrist Dr. Eyad Sarraj, will be receiving the donations. The boat will attempt to reach the coast of Gaza and unload its aid cargo in a nonviolent, symbolic act of solidarity and protest — and call for the illegal siege of Gaza to be lifted to enable free passage of goods and people to and from the Gaza Strip. The boat will fly multicolored peace flags carrying the names of dozens of Jews who have expressed their support for this action as a symbol of the widespread support for the boat by Jews worldwide. Speaking from London, a member of the organizing group, Richard Kuper of Jews for Justice for Palestinians, said today that the Jewish Boat to Gaza is a symbolic act of protest against the Israeli occupation of the Palestinian territories and the siege of Gaza and a message of solidarity to Palestinians and Israelis who seek peace and justice. Passenger Reuven Moskovitz, 82, a Holocaust survivor, said that his life’s mission has been to turn foes into friends. “We are two peoples, but we have one future,” he said. Activist Rami Elhanan, who is also on board, said: “We are banging our head on a very hard wall of hatred. Our hope is to make little cracks on that wall, so that in the end it will fall. “Whatever happens, the worst thing has already happened to me, I am not afraid of what is coming next,” added Elhanan, who lost her daughter in a 1997 suicide bombing. Read the AFP report here. Reuven Moskovitz, from Israel, is a founding member of the Jewish-Arab village Neve Shalom (Oasis of Peace) and a holocaust survivor. Speaks German, Hebrew and English. Rami Elhanan, from Israel, who lost his daughter Smadar to a suicide bombing in 1997 and is a founding member of the Bereaved Families Circle of Israelis and Palestinians who lost their loved ones to the conflict. Speaks Hebrew and English. Lilian Rosengarten, from the US, is a peace activist and psychotherapist. She was a refugee from Nazi Germany. Speaks English and German. Yonatan Shapira, from Israel, is an ex-IDF pilot and now an activist for Combatants for Peace. Speaks Hebrew and English. Carole Angier, from the UK, is the biographer of the renowned author, Auschwitz survivor Primo Levi. Speaks English, French, Italian and German. Glyn Secker, from the UK, is the boat’s captain and a member of Jews for Justice for Palestinians. Speaks English. Dr. Edith Lutz, from Germany, is a peace activist and a nurse. She was on the first boat to Gaza in 2008. Speaks German and English. Alison Prager, from the UK, is a teacher and peace activist. She is media coordinator for the boat. Speaks English. Itamar Shapira, from Israel, is Yonatan’s brother, and a member of the boat’s crew. Speaks Hebrew, Spanish and English. Eli Osherov, Israeli reporter from Israel Channel 10 News. Supporters: Jewish organizations and individuals from the UK, Holland, Germany, the US, Switzerland, Denmark, Sweden, Belgium, France, Austria, Australia and Israel. Organizers and sponsors: European Jews for a Just Peace, Jews for Justice for Palestinians (UK), Juedische Stimme fuer einen gerechten Frieden in Nahost (Germany), American Jews for a Just Peace (USA), Jewish Voice for Peace (USA), and Jews Against the Occupation Sydney. 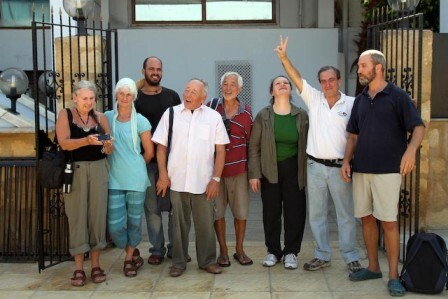 Visit www.jewishboattogaza.org and join us on Facebook and Twitter (links on site). A fabulous party Tuesday night in Brooklyn was the latest in a series of nation-wide fundraisers to send an American boat to break the siege of Gaza. The Siege Busters’ Ball featured hours of eclectic performances, connections, conversations, and shoulder-shaking Arabic dance music into the small hours of the morning. DJ Ibrahim, co-owner and resident DJ of East Village lounge Babel, started the night off spinning Arabic dance tracks while guests mingled over beers and watched hundreds of photographs from the West Bank and Gaza projected onto a screen behind the stage. Ryan Green hosted the performance part of the night, which started at 9pm with a reading by Pamela Olson from her book, Fast Times in Palestine. Daniel Maher was next, followed by haunting Portuguese Fado singing infused with strength and suffering by Ryan Green, then spoken word by poet and playwright Ismail Khalidi. Monstah Black performed “Black like Jesus,” then Marcel Cartier and Mazzi & S.O.U.L. Purpose had everyone on their feet dancing to the beats of their music with a message. The night was rounded out with hours of dancing to the stylings of DJ Vega Benetton from Existence is Resistance and DJ Ibrahim. 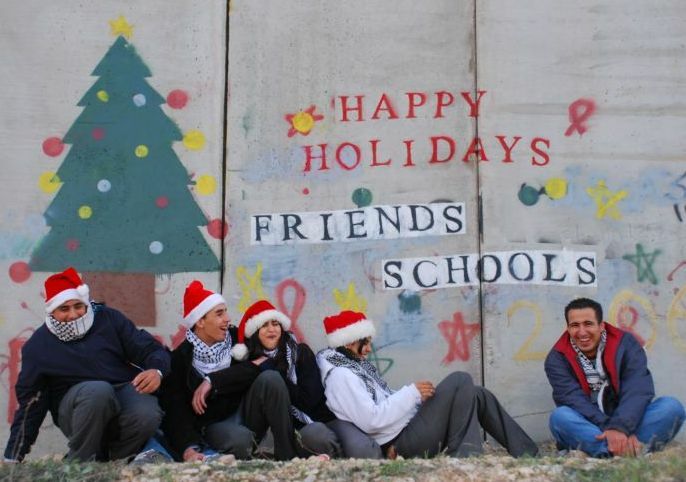 I ran into many people I knew well, others I had only heard of, and some I had met in Ramallah months or years before. Overall it was a thrilling evening that brought together people from all over New York and brought the total money raised for the US Boat to Gaza to more than $243,000 of the $370,000 necessary to launch the boat. An event the following night at Brooklyn Law School underscored the importance of our mission to bring a US boat to Gaza. Fatima Mohammadi, a lawyer, activist, and Mavi Marmara survivor, narrated a smuggled fifteen-minute film of the attack on the Mavi Marmara by Cultures of Resistance. It was one of the precious few recordings of that event not confiscated, destroyed, or used selectively for propaganda purposes by Israel. I had seen the heartbreaking, shocking film before, but seeing it on the big screen narrated by an eyewitness made for a much more gut-wrenching experience. Audience members gasped, cringed, and in some cases cried while she narrated the terrifying attack and brutal murders of a cameraman, a jujitsu champion, a teenager with American citizenship, and many others, and the severe injuries of Malaysian doctors, an Australian with his knee shot out, and a soldier who pointed his gun at a one-year-old child. She said it brought home, in the most visceral way possible, what Palestinians go through on a daily basis, and the fact that people of conscience have no choice but to put their bodies on the line to end these horrors, or at least support the people who choose to. An American boat to Gaza, she said, would be the ultimate symbol of our rejection of these policies, which are going on in our name, with our tax dollars and under our government’s political cover. Glenn Greenwald, a Constitutional lawyer and contributing writer at Salon with frequent TV appearances, spoke next about the incredible fact that Israel gunned down nine unarmed people in international waters and virtually the entire world condemned the act. Many leaders were, in fact, so shocked by it that some dispensed with the usual diplomatic-speak and dared to express raw human disgust and horror. Yet the story in the US media is that the ship was full of terrorists who had it coming to them. The Cultures of Resistance video clearly shows what happened: Dozens of Zodiac rafts surrounded the ship in international waters and shot live ammunition along with pellet guns, sound bombs, and tear gas, at the people on deck. There was already blood on the walls of the ship, and several fatal injuries, before a single commando descended. As Greenwald said, for the US media to take Israel’s video and story at face value after it had killed nine people, kidnapped over 600, stolen or destroyed their personal belongings and (nearly) all documentary evidence, and then released only a heavily-edited slice of video of its own choosing was almost comically unreasonable. Imagine if there was a traffic accident and one of the people involved, who had filmed the accident from his perspective, offered only a small slice of his footage and also admitted to going into the other person’s car while he was unconscious and stealing all documentary evidence from the other driver’s perspective and refusing to show it to anyone. Any court in the world that would take his story and slice of video at face value would be violating the most basic tenets of common sense that evolution was kind enough to bestow upon us. Yet this is precisely what the American media did. This was no accident. Leon Uris was financially supported and sent to Israel by Edward Gottlieb, an eminent American public relations consultant, to write the novel. It solidified the American image of heroic pale-skinned Israelis vs. brutal, squabbling Arabs that persists to this day. Since then, the hits have kept on coming. By the time Israel’s army murdered nine innocent people on a humanitarian aid ship in international waters, admitting such a thing was even possible was tantamount to dismantling sixty years of a carefully-constructed image painstakingly built by multitudinous layers of established institutions. Yet, Khalidi said, this carefully-constructed image is finally beginning to unravel. It first began to fray in 1982 when Israel bombed and besieged Lebanon for months in full view of worldwide television audiences and killed 17,000 people, overwhelmingly mostly civilians, a sweep of carnage that reached its grisly peak with the Sabra and Chatila massacres. But there’s much more work to do. We need to write books and plays and poems, we need to make films, we need to visit the Middle East if it’s within our means or bring a speaker to our church or synagogue or high school or college who has been there. We need to continue the Boycott, Divestment, and Sanctions movement. We need to organize around and fund the US boat to Gaza. Be a part of history: Host a house party fundraiser, put a pickle jar next to your cash register, send a bucket around at your next event, and send the proceeds to the US Boat to Gaza campaign. I find it heartening that it took so much work for Israel’s PR masters to construct a false narrative of always-righteous victimhood—that they even stooped to playing on genuine worldwide sympathy for the victims of the Nazi Holocaust, an event that rightly shocked the conscience of mankind. Because deep down, they know that no decent human being, if they fully knew the truth, would countenance Israel’s overtly racist policies and brutal methods of enforcement for a second. People engaged in indecency have to construct the most elaborate stories, the thickest intellectual blinders, to do what they do, and to convince others to support what they do. Because human nature instinctively abhors injustice. This, along with the truth, is our greatest weapon. Siege Busters Ball, September 21 in Brooklyn! Please come, bring friends, and tell everyone you know! 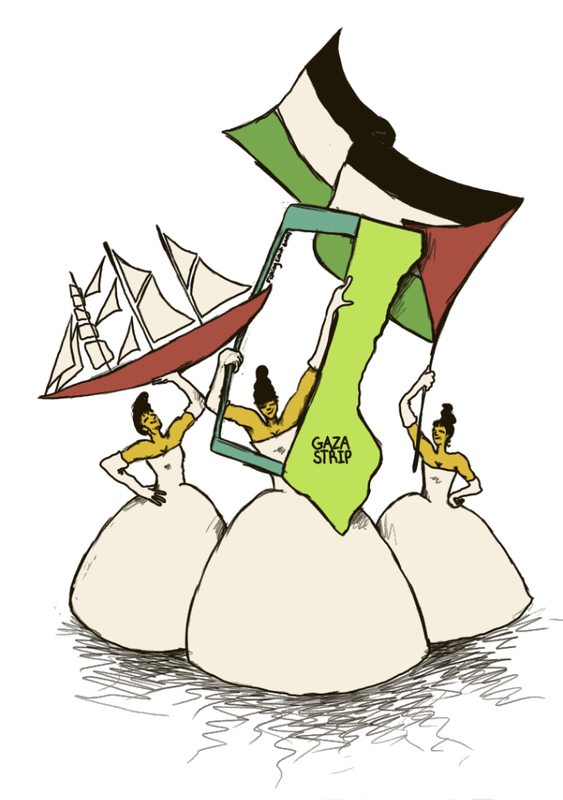 All proceeds will go to support the US BOAT TO GAZA, so give as generously as you can! 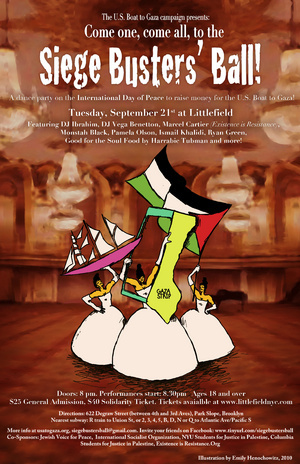 Dance the siege away at Littlefield in Brooklyn to free Gaza! Tuesday, September 21st, from 8pm – whenever! I wrote Fast Times in Palestine because so many Americans still don’t have even a basic grasp of the realities in the Holy Land despite (or perhaps because of) watching hours of mainstream media coverage. For the same reason, I’ve developed a presentation called “Beyond the Headlines” that I’ve given at Google Tech Talks, Stanford University, and Oklahoma University, among other venues. It begins with half an hour of pictures and stories about the good life in Palestine — jokes, harvests, school dances, public pools, bars, concerts, coffee shops, churches, soccer games, etc. Many people have told me this was the first time they saw Palestinians portrayed as normal human beings, and it affected their perceptions profoundly. The second half-hour is all about the occupation — checkpoints, invasions, settlements, the Wall, the theft of East Jerusalem and the siege of Gaza. It’s a basic but devastating and engaging primer that leaves a visceral impression of what’s being done to Palestinians in our name and with our tax dollars. In this time when “peace talks” are starting up again and siege-busting boats are heading to Gaza, a disturbing number of Americans still lack even a basic idea of the political and personal realities in the West Bank and Gaza. This talk can serve as a much-needed introduction to the Palestinian perspective. Here’s the version of the talk I gave at Google. It can be tweaked for time and emphasis. If it can be of use to any organizations, churches, universities, high schools, etc. this fall, I’ll be happy to give it as a teach-in, fundraiser, or guest lecture. I’m based in New York and can be reached on pamolson @ gmail.